History recorded Nixon-Kissinger Vietnam Treason in great detail. I ask my readers to note that on October 19, 1972, Dr. Henry A. Kissinger was not the US Secretary of State. He was administered the oath to that office on September 22, 1973. For that reason, on October 19, 1972 Kissinger had no authority to negotiate with foreign Heads of State on behalf of the United States. Nixon-Kissinger negotiated Peace Treaty giving aid and comfort to the Enemy while US forces in Vietnam were still fighting against the Enemy. 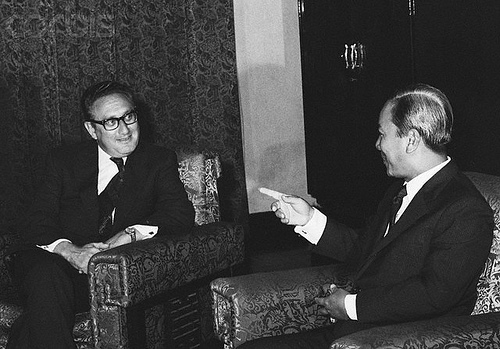 Henry Kissinger and U.S. officials hold meetings in Saigon with South Vietnamese President Nguyen Van Thieu to discuss the proposed peace treaty drafted by Kissinger and Le Duc Tho, the chief North Vietnamese negotiator in Paris. Thieu remained adamant in his opposition to the draft treaty provisions that permitted North Vietnamese troops to remain in place in the South. Kissinger tried to convince Thieu to agree to the provisions anyway, but Thieu still balked. This would be a major stumbling block in the continuing negotiations. In an attempt to further the peace process, President Nixon announced a halt in bombing of North Vietnam above the 20th parallel. He also sent a message to North Vietnamese Premier Pham Van Dong confirming that the peace agreement was complete and pledging that it would be signed by the two foreign ministers on October 31. However, Thieu’s continued recalcitrance caused so much friction at the negotiating table that the North Vietnamese walked out. They returned only after Nixon ordered the resumption of the Linebacker II bombing campaign against North Vietnam. The peace treaty was eventually signed in January 1973 (after the United States threatened to sign it alone with the North Vietnamese if Thieu refused to participate) and the cease-fire went into effect at midnight on January 27, 1973. 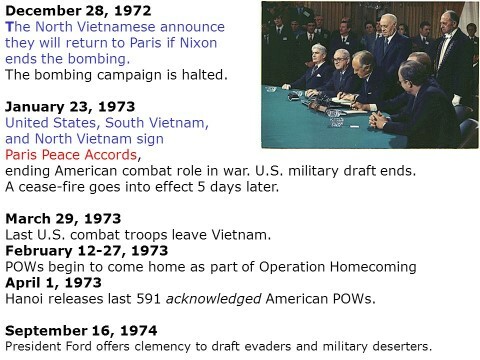 Under the terms of the treaty, all U.S. military forces departed two months later. As Thieu feared, the peace treaty left 160,000 troops in the South and the fighting in South Vietnam resumed after only a brief pause. As U.S. military aid, which had been promised by President Nixon, slowed and then ceased altogether, the South Vietnamese were left fighting for their very lives. They held out for two years, but succumbed to the North Vietnamese in 1975, when Saigon fell in just 55 days.